Picasa 3 – For Photographers? I must admit, I’m very impressed with Picasa 3. The features, the ease of use and the absolute simplicity by which you can quickly edit your photos and upload them. It may seem a little surprising that someone can recommend Picasa of all the things (photoshop, lightroom, gimp) for photo editing. Don’t get me wrong, I don’t recommend using Picasa if you’re planning on submitting your photos in a competition. If it’s just one or two photos that you’re trying to edit, Photoshop/GIMP is the way to go. But what do you do when you’ve got about a hundred photos and can’t really batch process them all. You’d need to look at each and every photo and move the levels, saturation, contrast sliders, create new layers, rotate the image, crop it and finally save it as a JPEG max for storing on your computer and a web JPEG to upload to Picasa/Flickr/other online album. I’ve done that quite a few times and I get tired of it very quickly. It’s fun to do it to one photo, but when you’ve got a 100 of them, it becomes very tedious and repetitive to do the same things to all the photos. The ideal way to do it would be the way Ken Rockwell does it – in the camera. 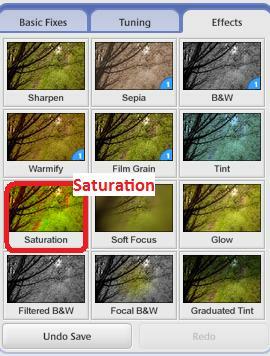 Try to get the settings on your camera right and minimise the effort in post processing. But this doesn’t happen unless you actually plan your photos and are extremely careful. I frequently find out after taking some pics that I’ve left the ISO in auto, white balance was left to whatever it was previously, my aperture is very narrow etc etc etc. These pics do need the colour adjusted, the brightness altered and so on. That’s where Picasa comes in handy. 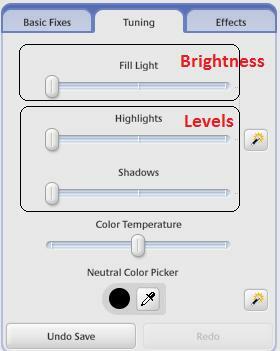 With just a few clicks and moving around a few sliders, you can perform most of the basic editing functions very quickly. The pics below show the equivalents of levels, brightness and saturation that you would find in photo editing software. Also, when you edit a file, Picasa saves the original (in a hidden folder I think in the photos folder) so that you can restore to the original pics at any time. After editing each pic, you can “pin” it using the pin icon and create a new album with only the pinned pics. Picasa then lets you upload them online to your picasaweb account and keeps your album on your desktop in sync with the one online. This is a lot of functionality that makes the life of a photographer that much more easier.